I basically picked up this mini based on the sweet cover for issue #1 and just grabbed the other issues because they were there. I had no knowledge of this character coming into this review, even though it seems like he actually has quite a bit of history in mainstream Marvel comics at the time. So let's step back to 1984 and see what this colorful character from the end of the Bronze Age is all about, shall we? We shall! That's a sweet cover right there! One of the most powerful beings on Earth is a willing prisoner of S.H.I.E.L.D. as they try to find a way to contain his immense power. After he attempts to commit suicide, his former girlfriend, Marcy Kane arrives to try and help keep Jack Hart under control. When the S.H.I.E.L.D. lab comes under attack by mysterious alien invaders, Jack is released. . .but after destroying the aliens, Jack has no intention of returning to captivity. So what we have here is mostly an origin story for Jack of Hearts. The issue is about 75% exposition, but coming into this series with no knowledge of the character, I'd say the issue did a fine job giving me everything I need to know about Jack Hart. . . He's the son of a brilliant and wealthy scientist. Jack fell into a vat of "Zero Fluid" during his father's assassination and immense power was unlocked. 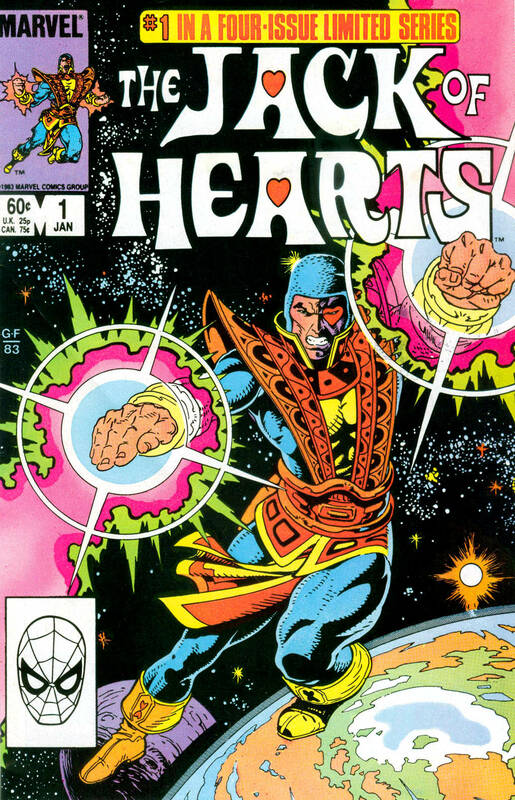 He took on the identity of Jack of Hearts and had dealings as both friend and foe of several A-List Marvel superheroes before going into exile. A pretty standard Bronze Age "Fell in some stuff and got some powers because. . .SCIENCE!" origin story. But told well and very nicely illustrated. Check this splash page out! VERY nice! Overall, I liked this issue. Some of the dialogue was a bit overdramatic, there's a LOT of exposition, and there are some pretty bad color art issues here and there. . .but for the most part the story was engaging and the art (including that eye-catching cover!) was well done. It made me want to get right into the next issue. . .what more could you want from a comic? Jack Hart discovers that his awesome powers were already inside him and were only unlocked and increased by his father's zero fluid instead of being caused by it, and that this is because his mother was actually an alien from the dying world of Contraxia. . .as is his lover, Marcy Kane, who now introduces herself in her alien form as "Kaina" during this revelation. His mind is, of course, blown. After a devastating conflict between S.H.I.E.L.D. and a faction of Contraxians who want to force Jack to re-ignite their dying sun, Jack agrees to go with them willingly to Contraxia and use his powers to help. So what we get in this second issue is pretty much ANOTHER origin story, expanding on Jack of Hearts' original "fell in a vat of stuff and got some powers" origin and swerving him more toward being a cosmic superhero in the vein of Silver Surfer. Because of this expanded origin story, this issue is (like the first) about 75-80% exposition, flashback, and backstory. Fortunately, it's pretty engaging. The building crisis of Contraxia's dying sun and the divisive opinion to let their civilization die with honor instead of forcing their way on to inhabited planets is really more interesting than Jack of Hearts' part in the story, in my humble opinion. The art also remains extremely strong. . .well, the line art, anyway. There are continuing color art issues that brings it down a notch. Other than some issues with the color art and a bit of overblown dialogue here and there, this was a pretty good issue overall. Jack of Hearts arrives on Contraxia and is hailed as a hero, but quickly learns that saving the planet's dying sun will mean sacrificing his own life. He decides that his own life is worth less than the billions he will save, so agrees to go through with it. The leader of the survivalist faction doesn't believe that Jack will sacrifice himself, so he captures Jack and kills the leaders of his rival faction, then puts Jack on trial for their murder. The Contraxians are fooled by the false trial and demand that Jack be shot into the center of their sun. In this third issue, we finally move past origin stories and flashbacks and bite into the actual meat of this cosmic tale of dying planets and heroic sacrifice. This is probably the best issue of the series so far, with clashing ideologies and a honorable man losing himself for the sake of survival. There's also a strong storyline about Jack deciding to sacrifice his life for the greater good. It's definitely a pretty good read. As Jack of Hearts is shot into Contraxia's sun, the Contraxians' celebrations turn into riots as they try to justify abandoning their moral code in the name of survival. The leader of the survivalist faction has a crisis of conscience and speeds to rescue Jack of Hearts and his lover aboard the doomed rocket. He arrives in time to save Kaina, but he dies during the attempt. Jack frees himself and flies into the sun, determined to save Kaina and the Contraxians, but instead of dying, he not only reignites the sun, but becomes even more powerful in the process. Realizing that he is now so powerful that his mere presence is destructive to living beings, he abandons his love and retreats to deep space. And so we come to the end of this tale of sacrifice and redemption. Jack of Hearts goes out a hero, but has to give up everything that tethered him to humanity in the process. It's a great ending and surprisingly emotional for a mainstream superhero comic coming in at the end of the Bronze Age. Overall, I was pleasantly surprised by the quality of the writing on this final issue. The art was also particularly strong this time out, with less color art issues. Some nice "Kirby Krackle" going on. 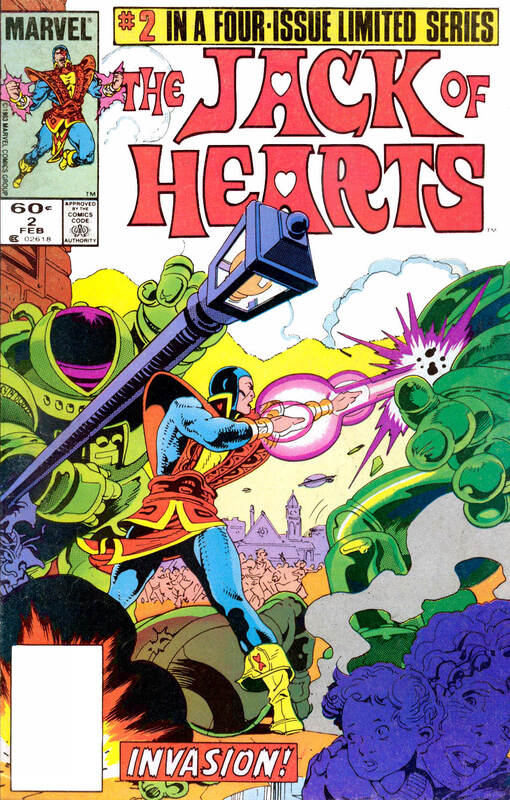 I came into this mini without any knowledge of Jack of Hearts at all, and truthfully, I wasn't very hopeful of finding much quality in a colorful mainstream Marvel superhero from the end of the Bronze Age. I was very pleasantly surprised to find a pretty well-written and illustrated tale of heroic sacrifice and how people change when their survival is at stake. Is it the best comic story I've ever read? No. But for what it is, I liked the story of Jack of Hearts. 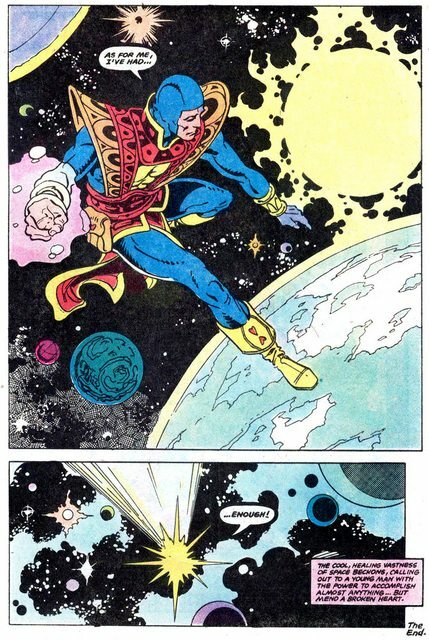 There are some color art issues through the series, some of the dialogue is overdramatic in a Bronze Age way, and there's a LOT of exposition in the first two issues. . .but if you are a fan of cosmic superheroes and stories that delve into moral issues, I can definitely recommend Jack of Hearts as a good read. How about another Longbox Junk Retro Review? Travel back in time with me to 1973 as I take a look at Michael Kaluta and Denny O'Neil's take on one of my favorite characters of all. . .The Shadow! Great review! 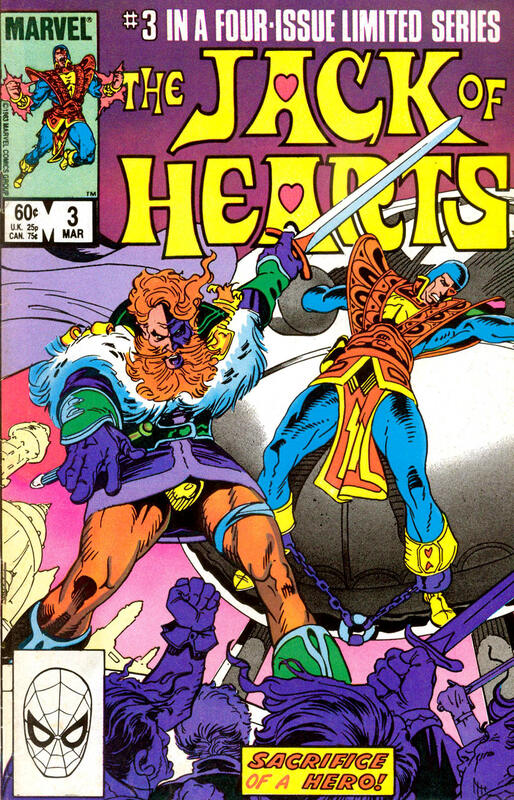 This Jack of Hearts mini-series came out during one of my insane non-comic book buying/reading periods, and I'd grab this up in a second if I found it the way you did. I've seen other people write about their love of these issues, and adding them to my collection sounds like the thing to do! Thanks for writing this insightful review. I think I remember reading somewhere that you said you do reviews that nobody asks for. That is a total untruth good Sir! I have found quite a few enjoyable blogs, THIS being one. I had that first issue back in the day, but never got the next 3, so thanks for the cranial jog. Thinking that this is now on the radar to add to my collection at some point in time. My initial search was unfruitful, due to condition or pricing, but hope to score one, one day. I always thought he was an interesting character, and was first introduced to him in Marvel Team-Up # 134. Thank you for not only your interesting and informative review, but for jogging my memory again.